Every now and then I luck out and find something neat for sale cheap, even if it takes some work to get it all. 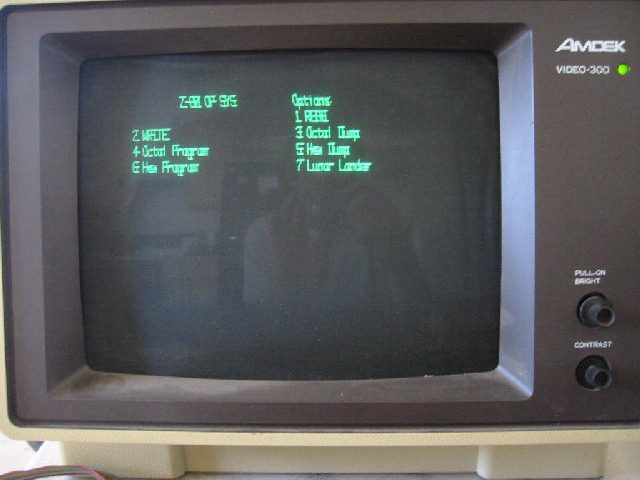 This is a 1977 vintage Z80 computer system, made by "the digital group". Search for the name on google.com to find more about these wonderful machines. I no longer own this computer. This is how it looked when I first got the system to actually respond. With the help of a serious digital group enthusiast, I discovered that a PROM that was packed separately inside the computer is for the cassette operating system, and he sent me a couple mp3 files containing the rest of the os and some games. Switching the PROM from the Diskmon one that was installed to the ZE resulted in a prompt to upload the operating system, and playing the mp3 file on the laptop, thru a cable to the cassette input port, got it up and running. 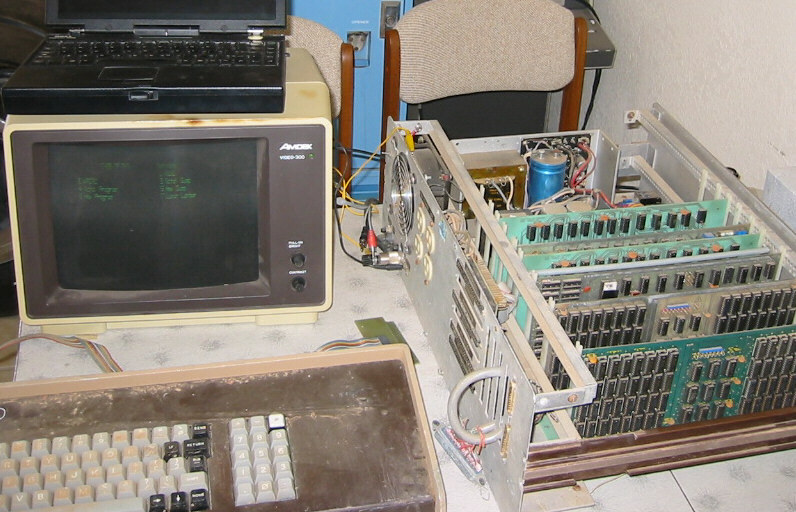 One thing that slowed me down was an added switch on the back panel, which was down, and needed to be up, to work. With this switch in the wrong position, the video was all blocks (7F). You can see that this thing has been out in the weather for quite a while. 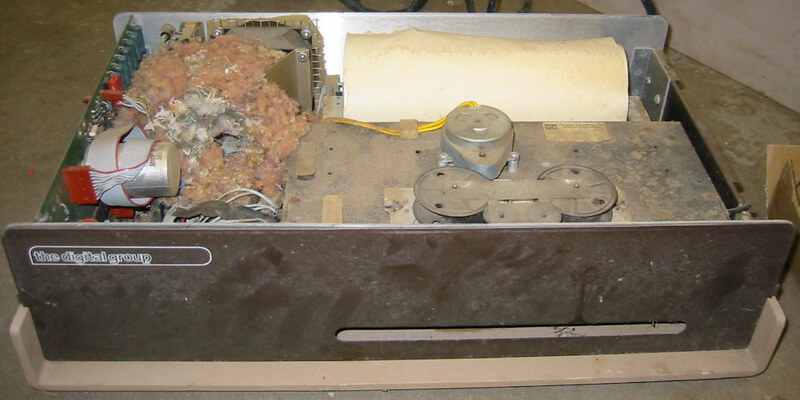 The main system unit appears to be intact, there were even a couple DG 8k ram boards laying inside, protected with aluminum foil. 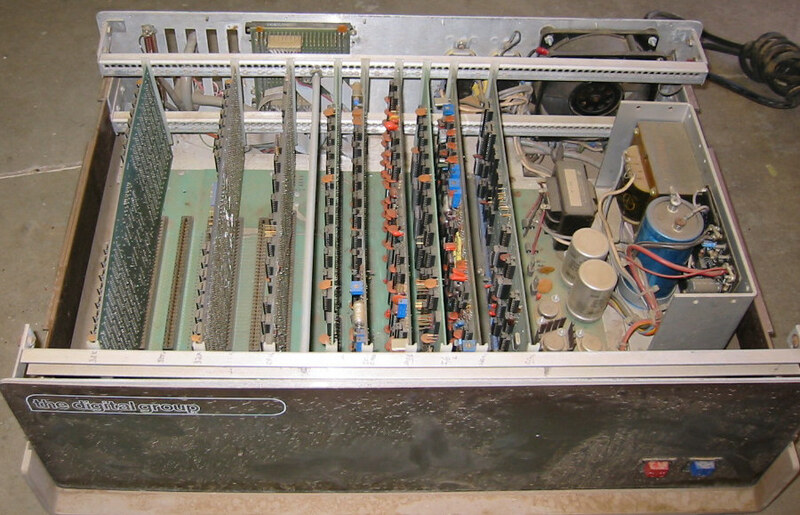 The board inventory includes two 32k memory boards, the Z80 cpu board, parallel i/o board, video and cassette, floppy controller, another 4 port parallel i/o, ham board, and serial board. 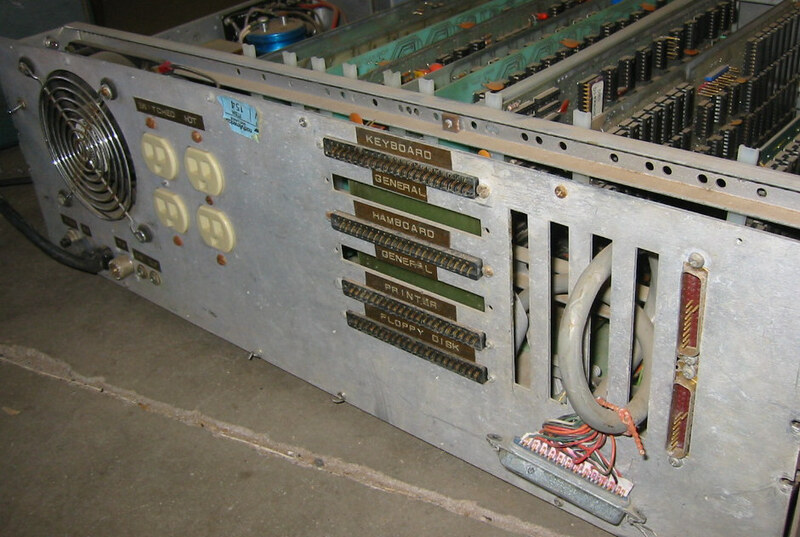 The serial board sits on a homebrew motherboard extension, and there is a two slot memory motherboard extension at the other end (5 memory slots total). Some of the PCBs are copyright 1975, others 1977, and the newest memory board is screened with yellow ink with the name "C.T. LTD", although it still has the "DG 32K-2" logo in copper. The keyboard seems to be all here, including the really high tech connector! Quite a dirty mess though. And it didn't work! I took it apart, and discovered that the foam that supports the foil for the top have of the capacitive switches has come apart in many of the keys. I replaced the foam/foil "contacts" with some cobbled together with regular kitchen foil and sticky foam mounting tape, and now it is working again, although not really as designed--instead of being a capacitive keyboard, it is now a conductive keyboard, because the foil I used is not insulated from the PCB pads. Will this cause problems? I don't know...if you do know, please tell me!. Gotta love the mouse that this machine shipped with! 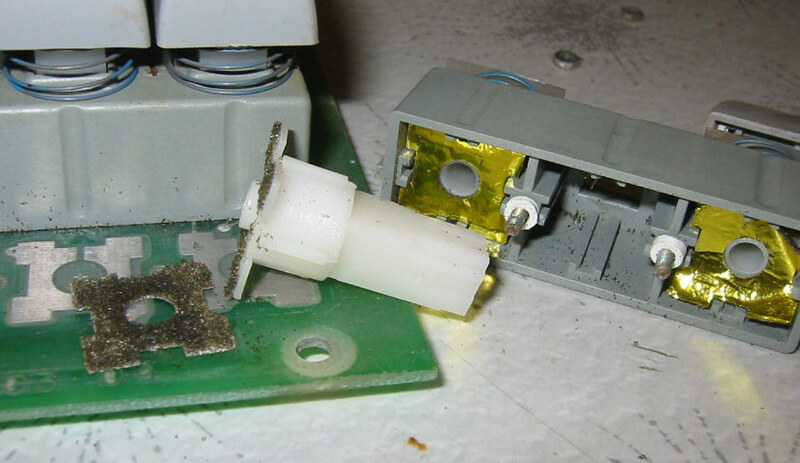 Some of the wires inside the (very rare) printer got chewed up, mainly the flex cable that drives the print head. This printer will need a lot of work. 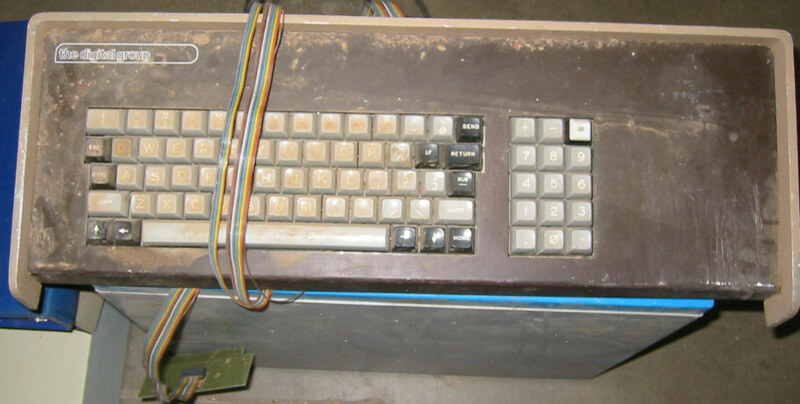 It looks like there have been some mods done to this case, but on further investigation, it appears that this is all original, except for the 25 pin serial connectors at the right, the cable with the blue ribbon connector, and the switch at the top left corner. It was nice of dg to supply 2 switched and two hot outlets. I also have a floppy drive setup that appears to have been used with this computer. The giveaway is the pcb edge connector on the end of the cable. The 8.5" x 11" Interface Age magazine is shown for scale. That's a BIG floppy drive! 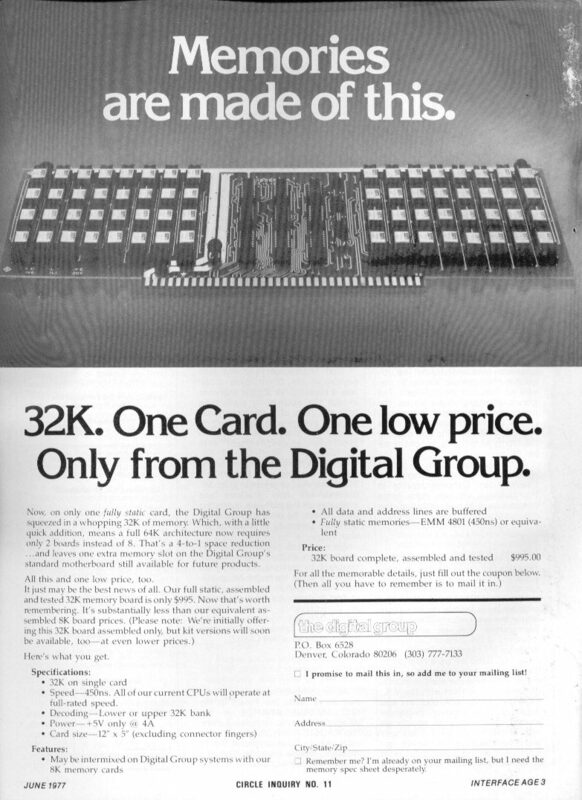 The PROM for use with the floppy drive was installed in the cpu card, the label reads "Diskmon3". 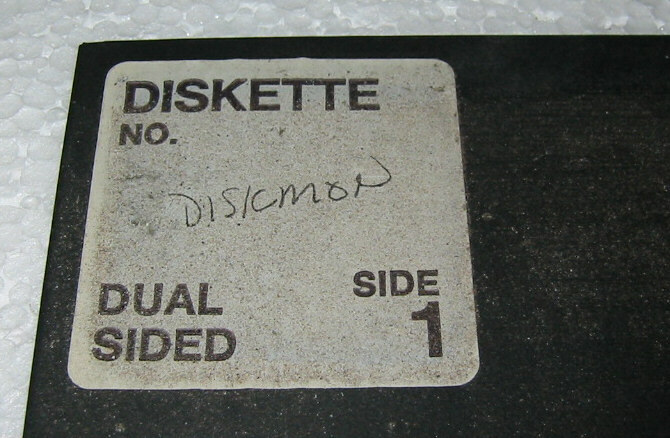 There were two floppy disks in the drive, one of which is the Diskmon disk, shown below (click the picture to see a closeup of the label). The other disk is an Oasis system disk. 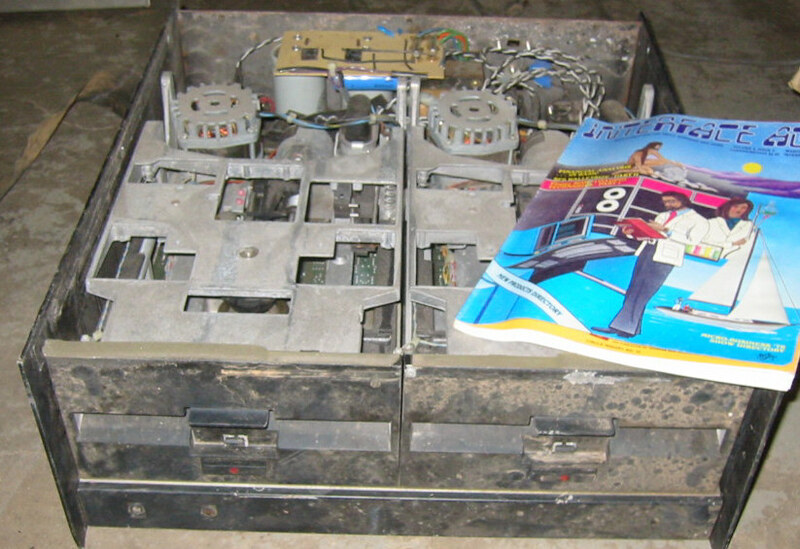 Both of these disks were exposed to the weather, and are now junk, unfortunately.